The Eleanor Rose Foundation was established in 2012 in memory of Ellie Jeffery, who was first diagnosed with breast cancer aged 27 and who lived with it for two years, writing a popular blog, Written Off (www.writtenoff.net), about her experiences of living with secondary breast cancer. The goal of the charity is to improve the lives of adults living with cancer by enabling them to access free and discounted services as well as informing them of beneficial services they are entitled to which they might otherwise be unaware of. 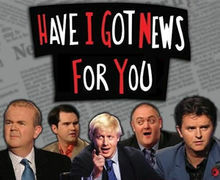 We have a pair of tickets to give away to the studio audience of Have I Got News For You, on the following dates: Show 1 – Thursday 4th April Show 2 – Thursday 11th April Show 3 – Thursday 18th April Show 4 – Thursday 25th April Show 5 – Thursday 2nd May Show 6 – Thursday 9th May Show 7 – Thursday 16th May Show 8 – Thursday 23rd May Show 9 – Thursday 30th May NB. Over 18's only. Location: Elstree Studios, Borehamwood, HERTS.